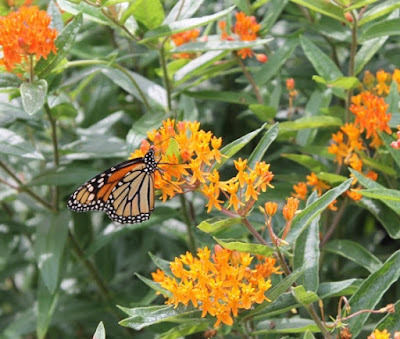 Grow native plants such as butterfly weed in your sustainable garden. 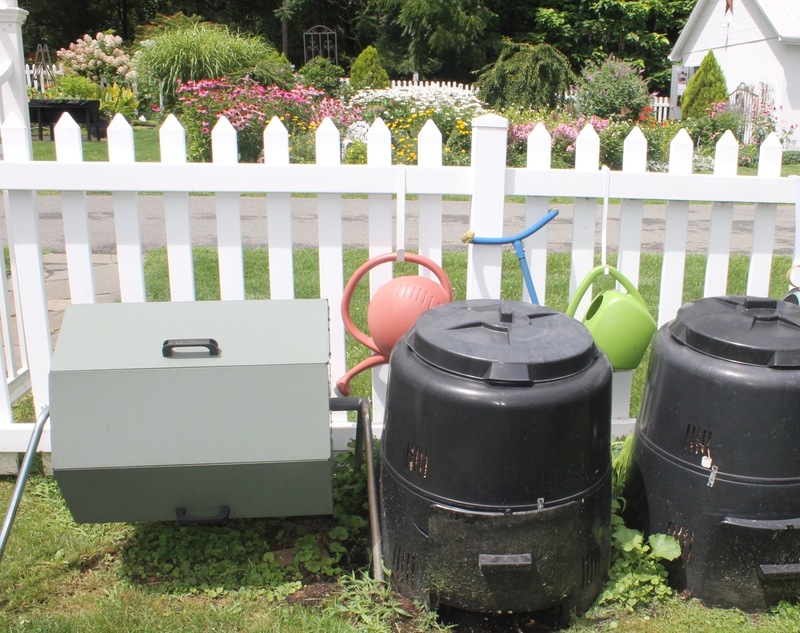 I have three compost bins, and some compost piles. 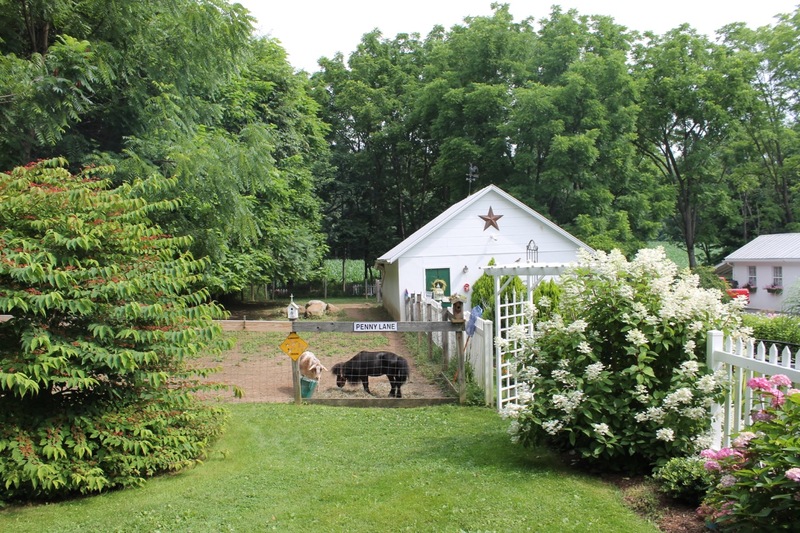 My mini horse, Dude, would produce great compost I'm sure, but the only storage places are under the many, many walnut trees on the property. 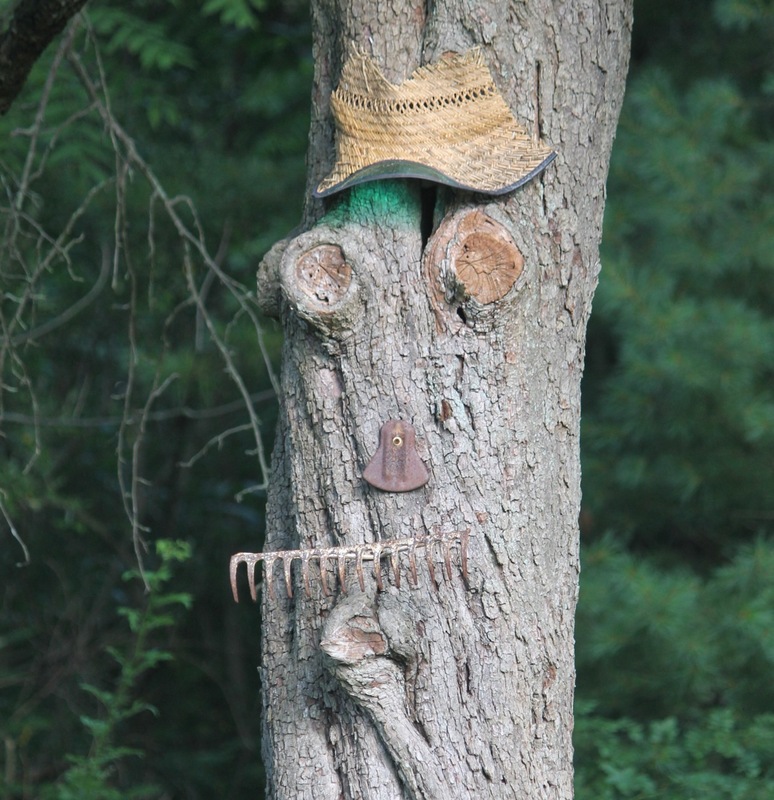 I'm afraid the juglone produced by the trees contaminates the compost -- as a result we lost vegetables two years in a row. So I stick to my compost bins that produce 'black gold' from garden cuttings, and the like. 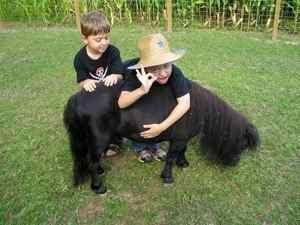 Dude has other attributes such as being great fun for the grandchildren. 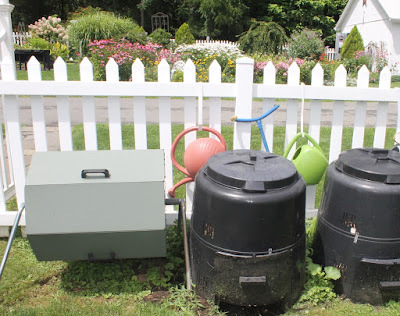 I recently harvested compost from the bottom of the middle bin by raising the door at the bottom. 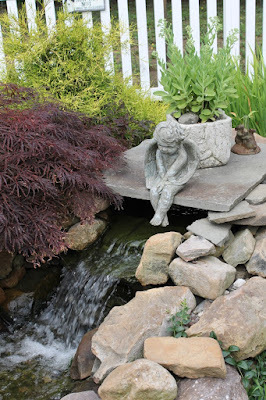 This is how the Serenity Garden began. Using compost means I need less chemicals. I also use seaweed or kelp as a fertilizer to feed the earth and encourage a natural rate of plant growth. 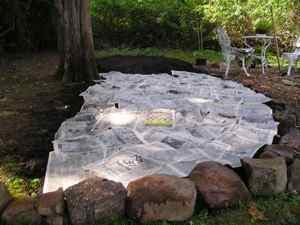 When making new beds, I cover weeds with cardboard or newspaper instead of applying herbicides. 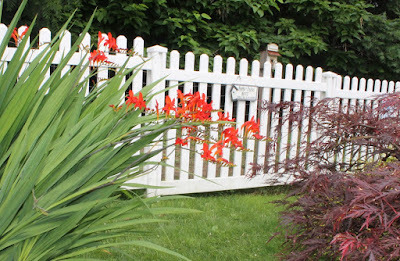 A chemical-free garden is a safe place for children. 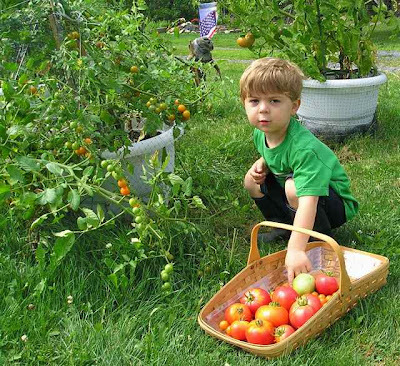 Without chemical pesticides and fertilizers you can still produce a bountiful harvest. My grandson, now aged 14, still helps me in the garden. 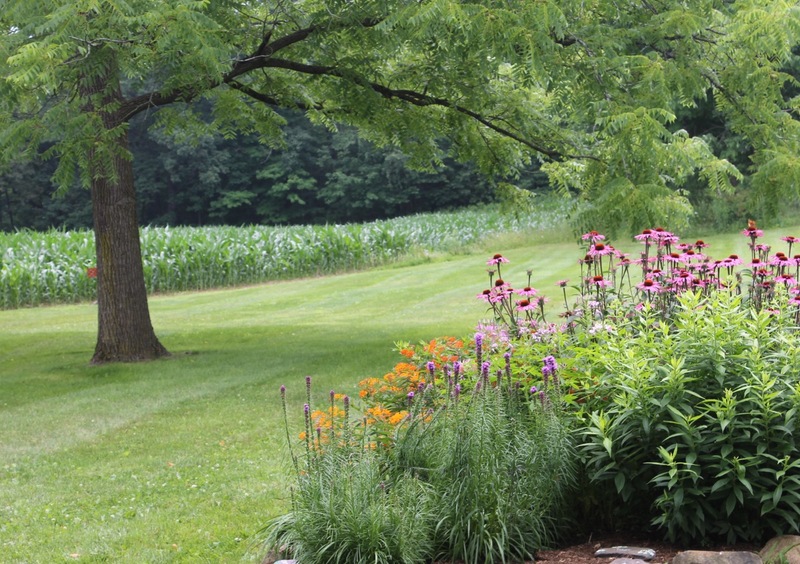 Mulching is a great way of helping the soil retain water. 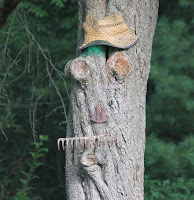 As those who follow my blog know, I use Canadian cedar mulch. I place soaker hoses under the mulch, but I mainly water by hand as I collect rainwater in barrels from gutters on the barn, tractor shed, and house roofs. 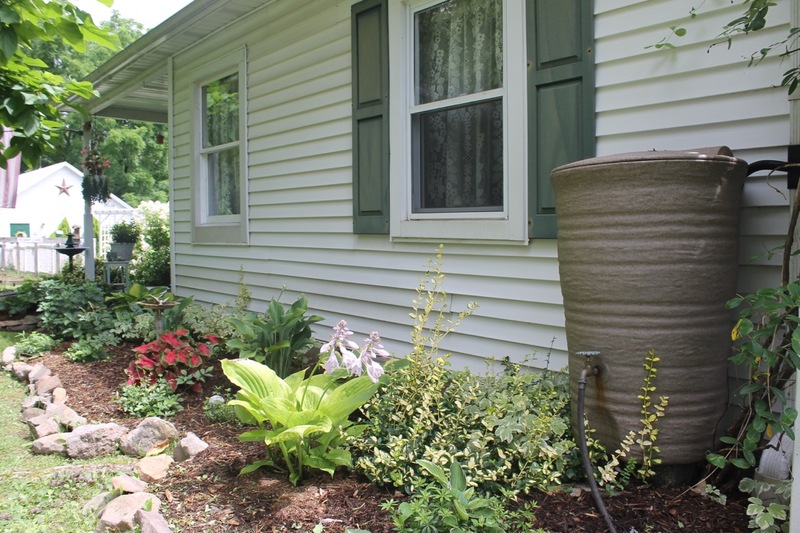 We have a total of five water barrels. 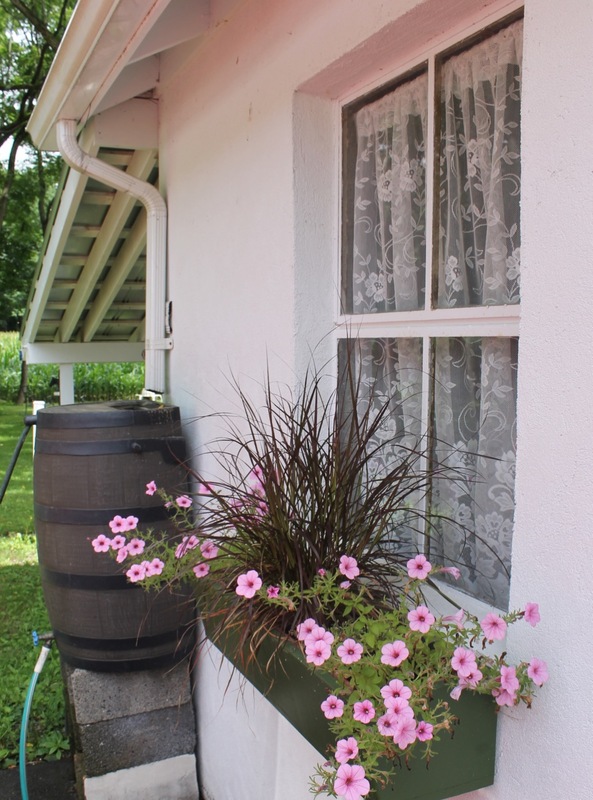 Barrel collecting water from the house roof. Lawns use more water and fossil fuels to maintain than any other planting. 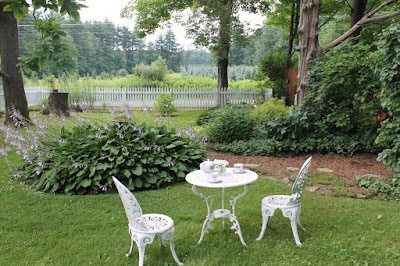 I eliminated most of the lawn in the cottage garden since I wrote the original article. We still have far too much lawn area, but I’m working on it! 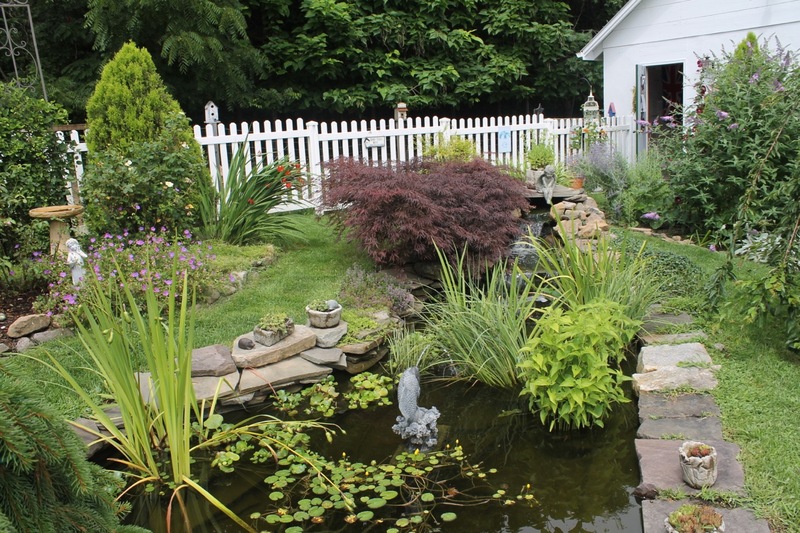 The pond and cottage garden occupy a former lawn area. Ladybugs are great predators for getting rid of aphids. 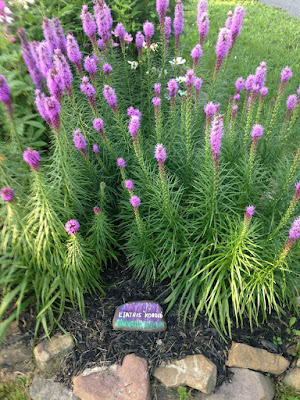 Releasing ladybugs and praying mantis is a wonderful experience for children and a treat for your garden. There is a tree under there. When we removed the multiflora rose, we revealed a pear tree. H.H. 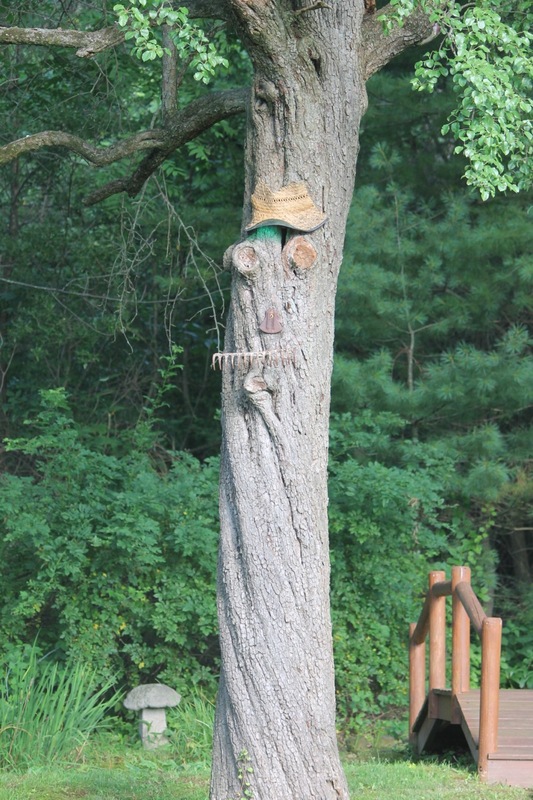 made the most of the tree's naturally formed 'eyes' and 'mouth' and added a nose from a tractor part, a rake for a moustache, and a straw hat. 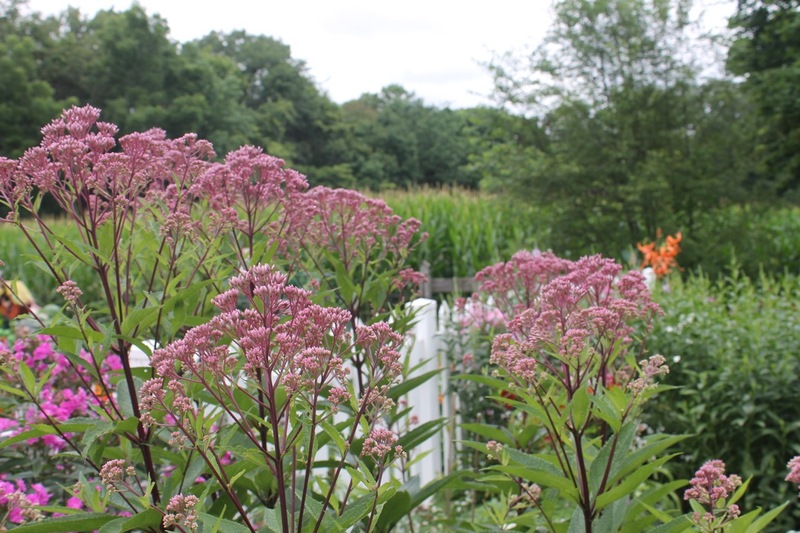 Invasive species can upset the delicate balance of a local ecosystem and even make some native plants extinct, therefore it is important to restore native plant communities. 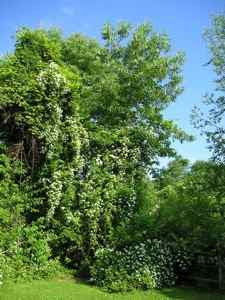 Native plants generally require less fertilizer and other additives. 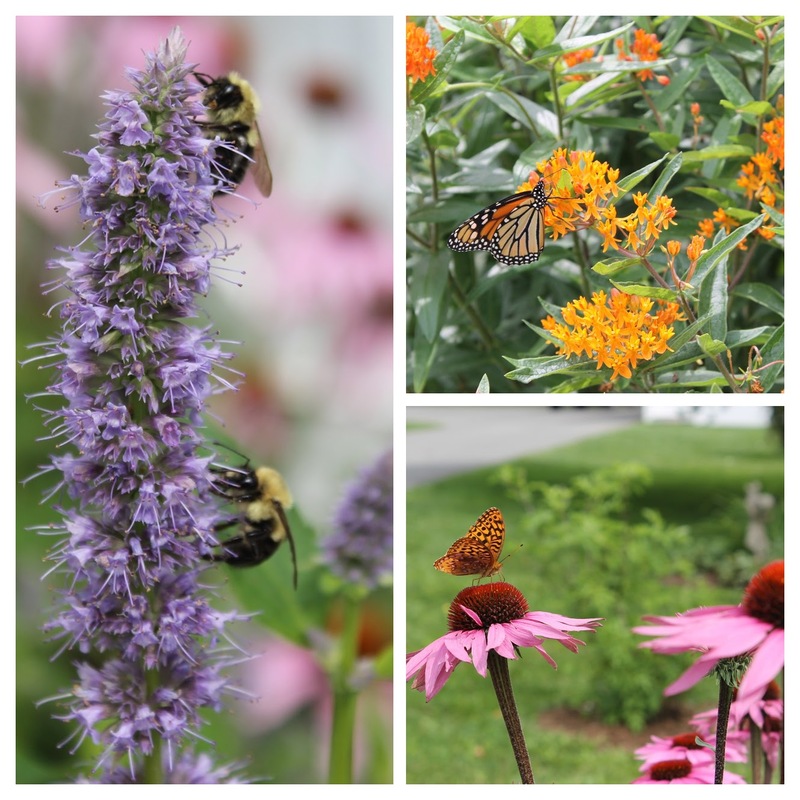 They encourage native wildlife such as pollinators. 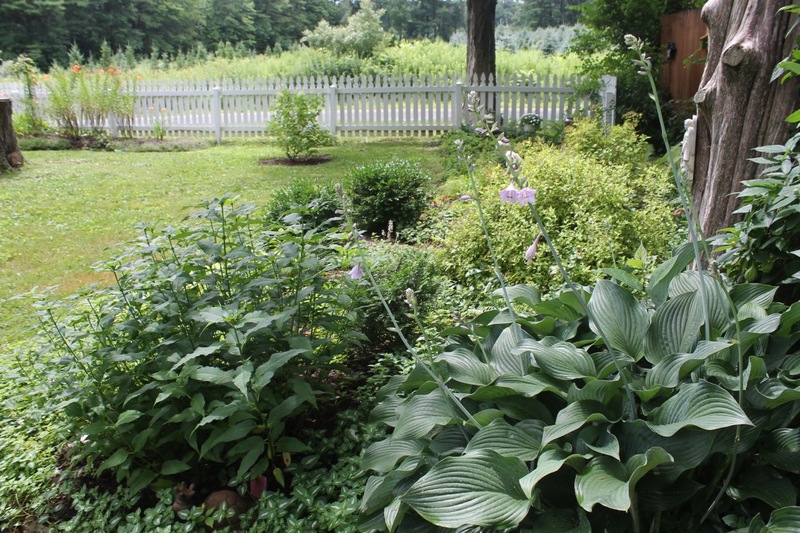 Some of the many native plants that I've added to my gardens over the years include columbine Aquilegia canadensis, wild ginger Asarum canadense, butterfly weed Asclepias tuberosa (lead picture above), turtlehead Chelone 'Hot lips', Joe pye weed Eupatorium fistulosum, dwalf crested iris Iris cristata, liatris Liatris spicata, and beebalm Monarda didyma. 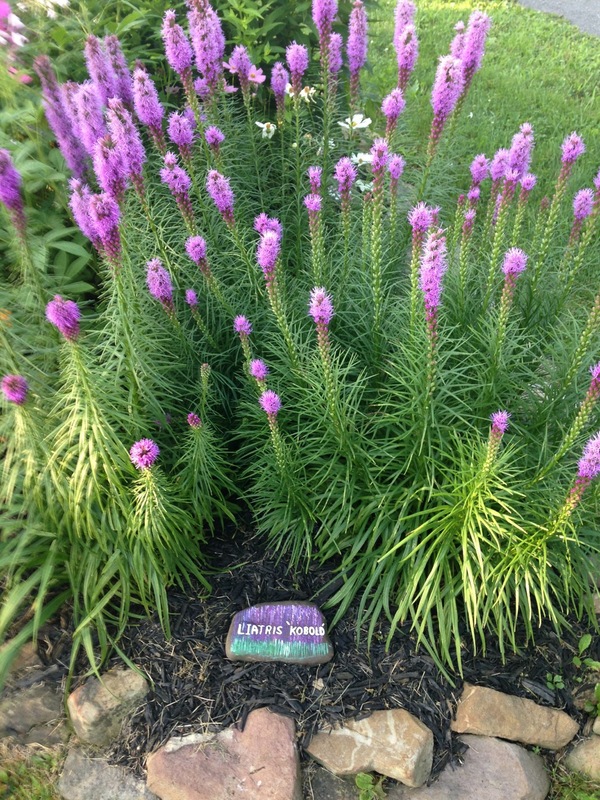 Turtlehead, bottom left, with buds about to burst into bloom today. 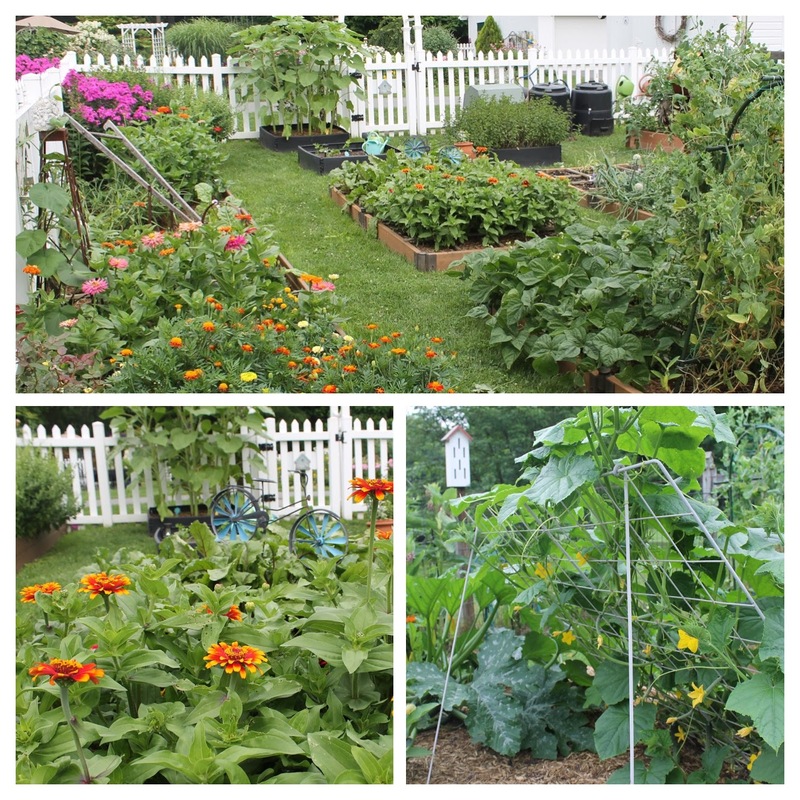 How do you practice sustainable gardening? 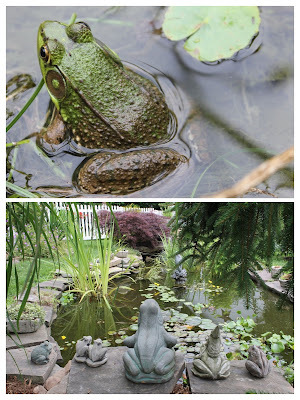 At last, I can see the fish in Froggy Pond thanks to Scott from Sugar Hollow Farms. He vacuumed the sludge from the bottom, installed a skimmer, and performed some magic. 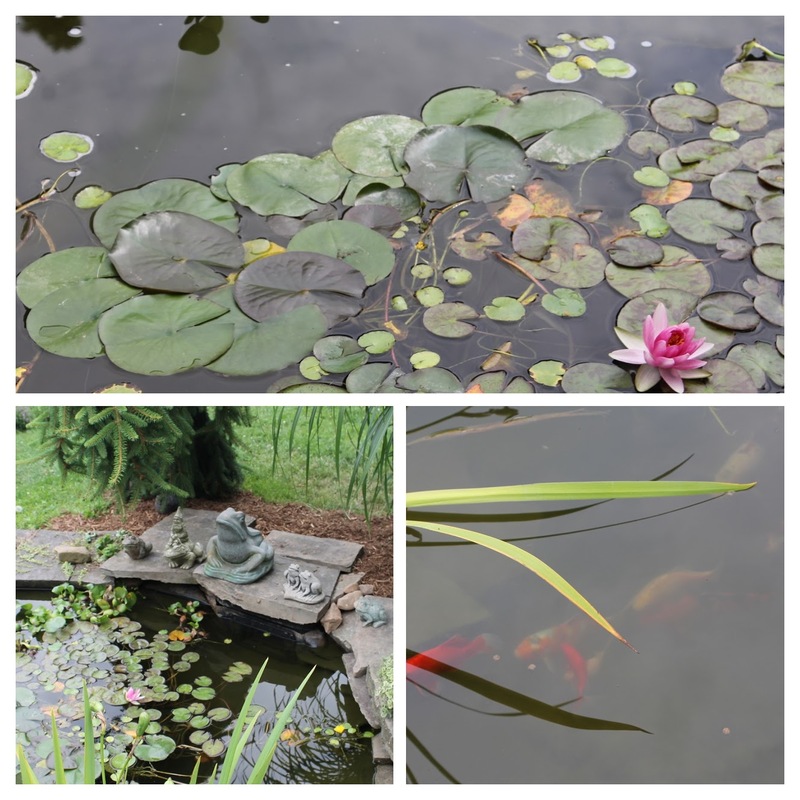 Over the years, our pond proved to be a money-pit due to some bad decisions we made earlier on, but the expense and work seem worthwhile as I enjoy its relaxing beauty today. I stole the name, Froggy Pond, from my blogger friend Diana in South Africa; she used the name first. Click here to see her environmentally friendly water feature. She graciously said I could use the name, so I guess I didn't really steal it. 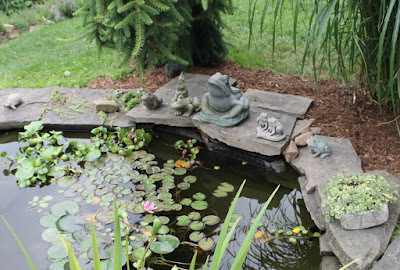 Our Froggy Pond has lots of real frogs as well as fake ones. 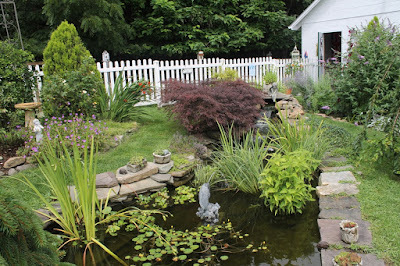 The pond was ready in time for the BIG EVENT last week when the local television channel arrived to shoot a piece for their program, 'Talk of the Town.' It was fun but exhausting -- 4 1/2 hours to make a ten minute segment. They filmed the gardens while I told their story. I demonstrated square-foot gardening and how to extend the gardening season with cool-season plants. I showed how to use row covers and a coldframe. (Yes, I was able to show off my new one!) Under my direction the hosts of the show, Marie and Kim, planted cabbages and such. The program will air in August. 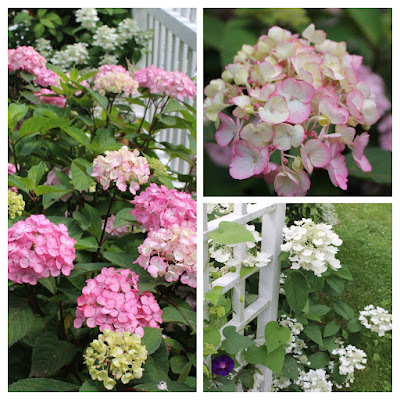 The hydrangea bed - front and right of Dude and Billy's paddock. 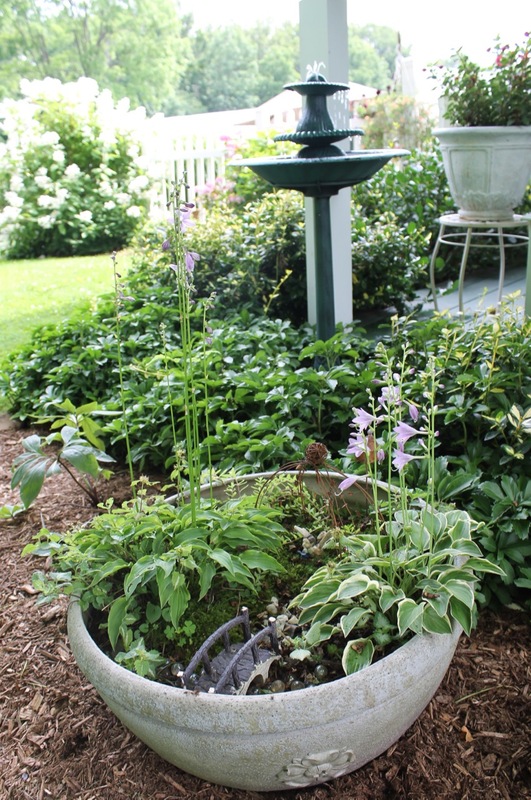 Several of the hostas in Serenity Garden are in bloom including the miniature hostas in the fairy garden. 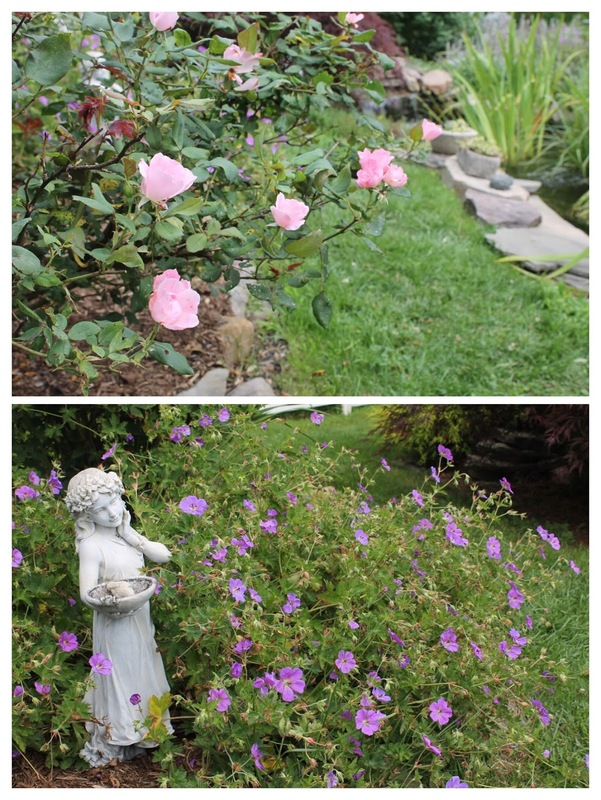 Due to the frequent, heavy rains this summer, my roses are very poor with black spot on the leaves and mushy blooms. 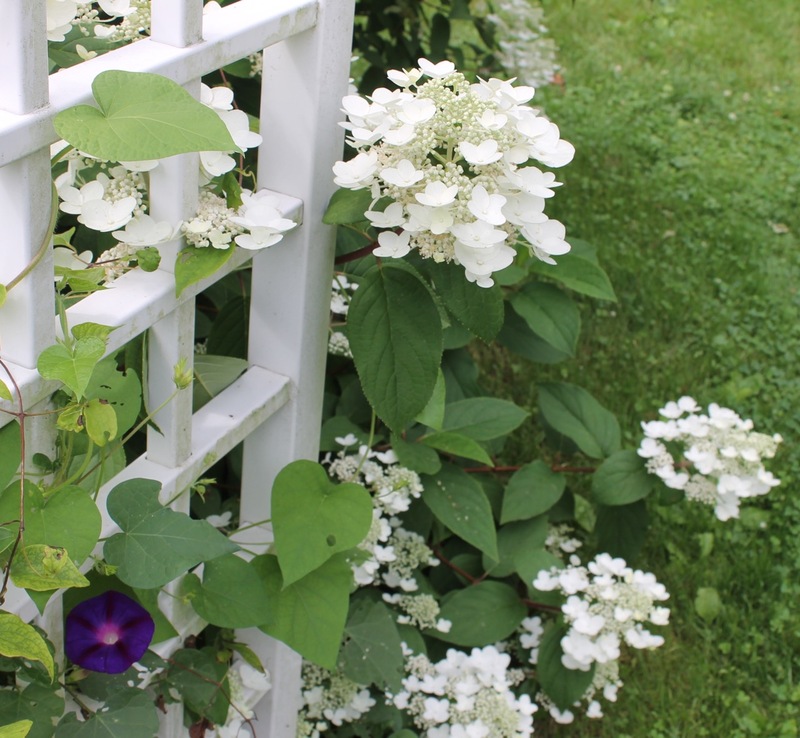 The clematis fared even worse. Has anyone else had this experience? Top: Pink Knockout rose. Bottom: perennial geranium. A very dark red (maroon?) hollyhock appeared this year. 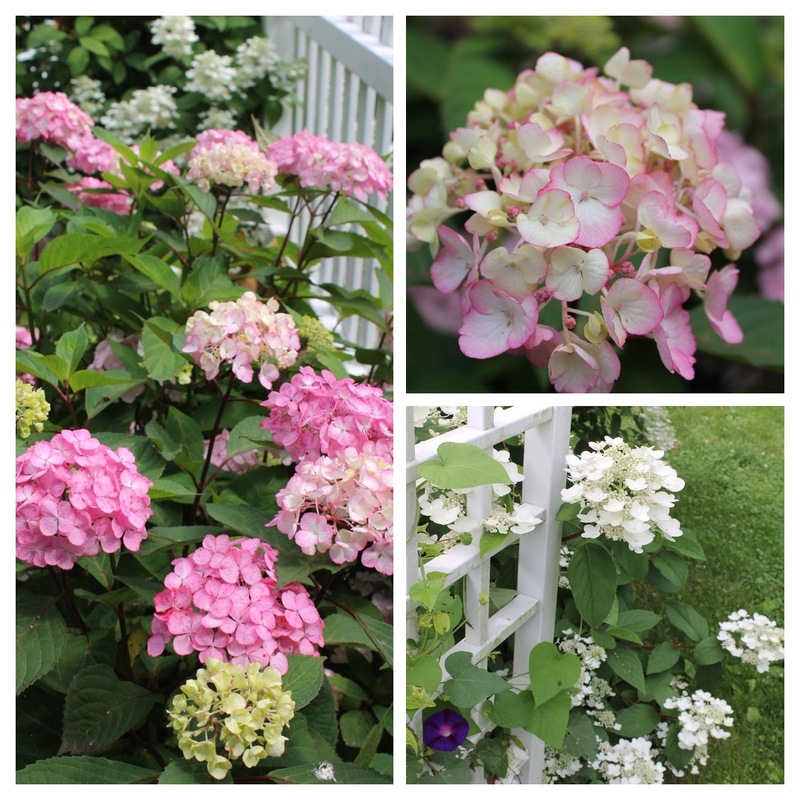 I think I planted a double one of that color last summer. It is beautiful but not as I remember it. 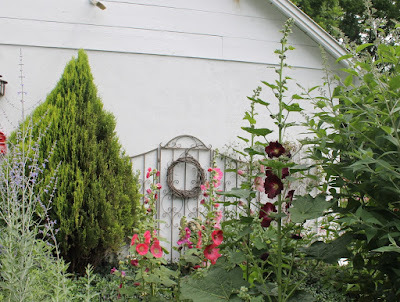 Hollyhocks are a classic cottage garden flower. 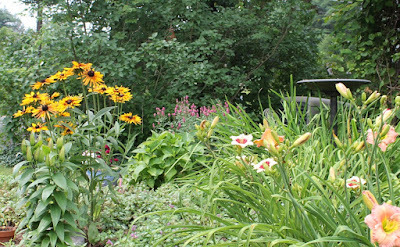 I love the combination of colors in the Horseshoe Garden right now: peachy daylilies, golden brown-eyed Susans, and pink veronica. H.H. painted the bicycle on the kitchen garden fence a classy, dark purple. 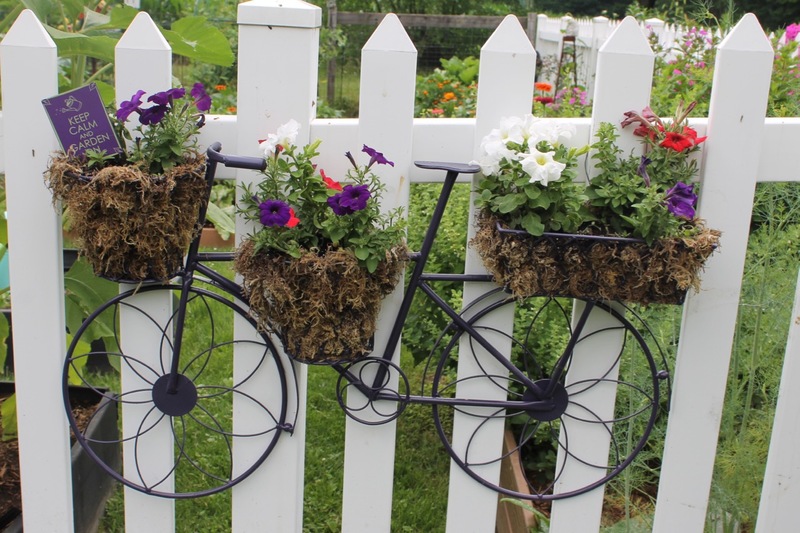 When dressed up with petunias it looks quite fetching. Bottom left: Zinnia Zowie™ Bottom right: blooms on cucumber plants. And with all my blooms the garden is buzzing with bees and fluttering with butterflies. 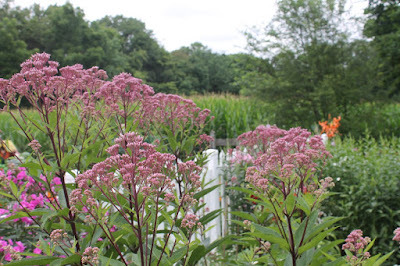 I'm welcoming back the monarchs and glad I planted so much milkweed. Left: Agastache .Top right: monarch on milkweed. 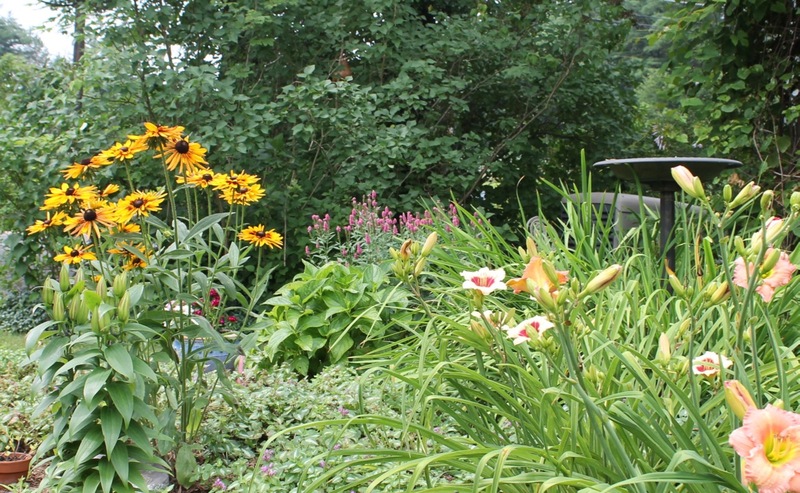 Bottom right: fritillaria on purple coneflower. 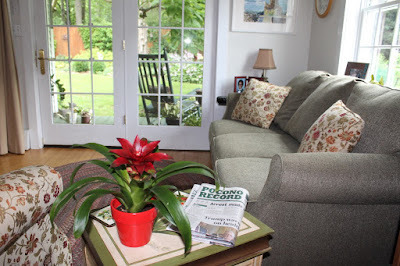 Finally, in the garden room I have a beautiful new bromeliad, given to me by a dear friend who visited me and my garden recently.